Senator Richard Polanco and Cesar Chavez in 1986. In the final stages of her life, Sally Marín, now Sally Ruiz Torres by marriage, still a member of the Apostolic Church, shared her account of being Chávez’ first corresponding secretary at the Madera C.S.O, along with her father Rev. Mariano Marín. Marín, an immigrant himself, a migrant farmworker and railroad worker also assisted the community in immigration matters. Pastor Marín did so, as Chávez recalls in La Causa, from the back house of the Madera Apostolic Church at the corner of 900 Madera and Lincoln Avenues (1940 US Census, 1946 Madera City Directory and Southern Pacific payroll ledger). Together, the Marín daughter and father team organized, stood by and voted along with Cesar one decade before mainline white ministers, Jewish and Catholic leaders came to Chávez’ aid. Aside from Chávez’ autobiography, the loud Apostólica Latina or Pentecostal voices that stood decisively by him remain ironically silent, unspoken and undocumented in Chicano History. Their songs’ influence and fiery spoken words have been nipped from history, neutered from the body of scholarship regarding the Chicano movement. Together Católicos and Apostólicos won critical victories and made history-changing votes for, arguably, the Movimiento’s most important leader. The religious background and spiritual influence of Chicana/o evangelicals, Latina/o Pentecostals and Mexicana/o Apostolic leaders have been almost non-existent or relegated to few footnotes. Ecumenical precursors of the Chicana/o movement gave rise to inter-religious Latina/o immigrant rights and cross-denominational community consciousness. Centro America refugee migrants organized across international church networks during the sanctuary movement of the 1980s. Faith and labor leaders collectively organizing spans a long rich history yet lacks a critical analysis of Latino faith immigrant and migrant communities, particularly its leadership and specifically Latina women. As a result, Senator Polanco’s vision of leadership had ample room for women. He can, with little doubt, be credited for running and electing a significant and critical number of distinguished Chicanas, among them distinguished figures such as Senator Martha Escutia, Senator Dr. Gloria Romero, Senator Denise Moreno Ducheney and Salvadoran-American Senator Liz Figueroa in addition to current Los Angeles County Supervisor Hilda Solís; a chicana-nicaraguense who, after election to Congress, went on to become the first-ever Latina presidential cabinet member as U.S. Secretary of Labor. In Anything but Mexican, Rodolfo Acuña also footnotes another Protestant-raised politician, Senator Art Torres, openly gay and the first Latino nominated for statewide office. Torres was attacked during his campaign by another candidate because he “was a Baptist in a heavily Catholic area,” (Bay Area Reporter). On record, we also have Texas born Gaddi H. Vasquez, a Bush White House-appointed ambassador to the Vatican and also an Apostolic “son of a minister and the grandson of Mexicans who immigrated to the United States” (Los Angeles Times, April 11, 1987). 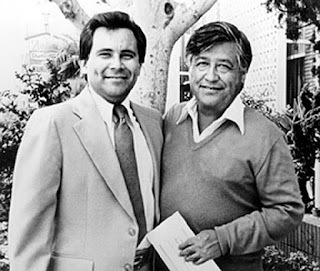 David Lizárraga, another well-known, if low key, Los Angeles Latino power-broker and an Obama Presidential appointee, is the son of a Presbyterian Pastor (Hispanic Presbyterians in Southern California). Along the long line of religious activism, an interdenominational Catholic-Apostolic alliance spontaneously emerged in East Palo Alto (Silicon Valley), when congregants met at both the local Catholic church and at the Apostolic church meeting half way in a march led by young Daniel Ramirez towards City Hall in order demonstrate their opposition to California’s anti-immigrant Proposition 187 in 1994. The long tradition of social service and organizing includes Rev. Manuel Vizcarra, a farmworker himself who labored alongside and lived among migrant farm workers in the government Labor Camp of Westley, CA. Vizcarra would become the national Presiding Bishop of the Apostolic Assembly and always understood the plight of the farmworkers firsthand as well as the ecumenical importance of overseeing his own migrant congregation. After the Rodney King riots, the Mexican-American Pentecostal Rev. Jesse Miranda (AG) of New Mexico organized and established the Alianza de Ministerios Evengelicos Nacionales (AMEN), a multi-denominational organization formed by and for Latino pastors across the nation. Along the same lines, Puerto Rican Luis Cortez, lead Esperanza USA in convening Latino Evangelicals to national bipartisan prayer breakfasts with several U.S. Presidents. Latina/o Protestants, Evangelicals, Pentecostales Apóstolicas/os have crossed the migrant agricultural and religious fields into the streets of East L.A., into the White House and across church denominations. Several U.S. Presidents have appointed Latina/o Evangelicals and Pentecostals, beyond Catholicism. Before being elected to Congress himself, Dr. Raul Ruiz led his faith community in social service, including several international expeditions with Doctors Without Borders, continuing the long lineage of Chicana/o Latina/o prophetic, religious, poetic, and political precursors who helped raise awareness about the plight of the Latinas/os in the United States. The psychology of slavery is traditionally associated with a need to seek spiritually and a reward for the sacrifice in the afterlife. Latina/o activism did not disrupt the spirituality of the Apostolics/Pentecostals. Activism generated the means to assist Chávez, the Chicano Movement and Latino leaders in the United States. The spiritual regeneration among the poor immigrant farm workers fueled activism seeking an answered prayer from the fields of Madera to the streets of East LA and at the highest foci of the U.S. government. Aleluyas have assembled in loud bilingual tongues, organized in the spirit of and for immigrant rights through ecclesiastical grassroots campaigns moving towards a political, ecumenical, labor and civil rights victory on earth, as it is in heaven. Special Thanks to Dr. Daniel Ramirez, Sis. Milca Montañez-Vizcarra and to the research of Lloyd D. Barba doctoral candidate at the University of Michigan.